Take a journey onboard a speeding mine train as it travels around Big Thunder Mountain over high crags and through deep caverns. 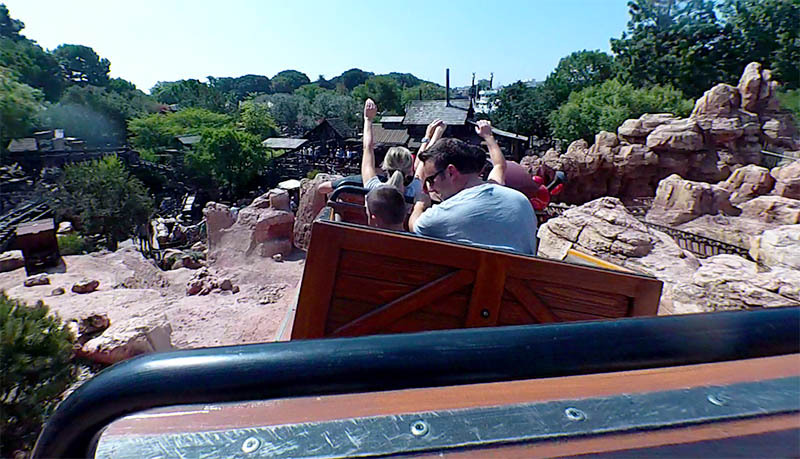 Big Thunder Mountain Railroad is a mine train style rollercoaster, which takes riders on a journey through Big Thunder Mountain and the surrounding abandoned 1800s mining town of Rainbow Ridge. The mine train speeds through tunnels and caverns, over ridges and past narrow rock walls and outcrops. At the climax of the rollercoaster, riders find themselves inside the mine as it is blown up with dynamite. The train quickly exits the mine, drops down a steep hill and speeds over a river before taking a sharp corner and returning safely to the station. Disneyland's version of Big Thunder Mountain Railroad was the first to open at a Disney park in 1979, although the rollercoaster had originally been designed to open first at the Magic Kingdom at Disney World. It was extensively refurbished in 2013/2014, with the old track and trains being replaced and new scenery and effects added.